Super Bowl XXXVI had a special significance outside the football realm: it was the first after the terrorist attacks only a few short months before. 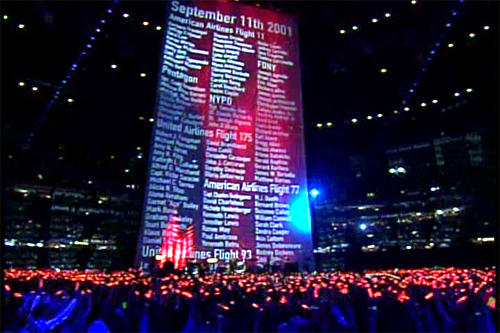 Concerns about security ran high, as the nation was traumatized by the events of September 11th and worried whether more such attacks on civilians were in store. Thanks to President Bush, we have not been hit since, but some healing was in order. Who best to deliver a halftime show to help along the way than U2? The YouTube video I’m going to link to below contains the second half of the show. I have a copy of the full show, raw as it was sent from the truck to the network, but I don’t have permission to put it online. The first song they play, Beautiful Day, is also on YouTube; just search for “U2 Super Bowl Halftime” and you’ll find it. But the part that had me standing, jumping, and cheering that day was the second song, perhaps their most famous: Where the Streets Have No Name. When Bono is walking with the microphone before he begins to sing, he quotes Psalm 51:15 – “O Lord, open thou my lips, and my mouth shall shew forth thy praise.” In an episode of VH1’s Behind the Music, U2’s manager tells the story of how, in the band’s early days, he’d find them in the bus after their shows reading the Bible instead of out partying it up. Apparently they’re Christians of some sort. According to the program, they almost called it quits when all the fame took hold because they didn’t know what it might do to them. They didn’t break up, however, although Bono has since jumped the shark. I like their music and choose to remember where they supposedly came from. Tonight’s halftime show was predictably garbage – half dressed “dancers” writhing around without a musician among them – so I tuned it out. In fact, I didn’t even get to begin watching the game until the start of the second half, which turns out to be the best part of the game. I kept a thumb on the remote button to switch away from any of the racy commercials, caught the Dodge Ram “Farmer” ad (easily the highlight of the night), and kept my family’s eyes safe from whatever assault Big Media had prepared for them. This entry was posted in Events, Media, Music, Video by Clint. Bookmark the permalink.